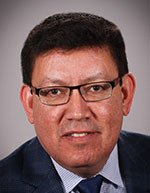 Dr. López was appointed as the University of New Mexico’s Vice President for Research in 2015 where he is also a professor in the Department of Chemical & Biological Engineering. Previously, Dr. López was a professor in the Department of Biomedical Engineering at Duke University’s Pratt School of Engineering and an adjunct professor in UNM’s Department of Chemical & Biological Engineering. At Duke, Dr. López was the founding director of the NSF’s Research Triangle Materials Research Science and Engineering Center (RT-MRSEC), which is focused on the programmable self-assembly of soft matter and currently includes approximately 60 researchers at Duke, North Carolina State, UNC-Chapel Hill and NC Central University. Prior to his time at Duke, Dr. López was a professor in UNM’s Department of Chemical & Biological Engineering from 1993-2010. During this time, he was the founding director of UNM’s Center for Biomedical Engineering (currently a member) and the Biomedical Engineering Graduate Programs. Dr. López also served for five years on the Board of Directors of STC.UNM. Dr. López’ current research interests include bio-interfacial phenomena, biomaterials, self-assembly and bio-analytical microsystems to address problems in medicine, biotechnology and environmental quality.